His nominator accurately described David Blythe when he wrote, “In a career which covers 50 years he has touched thousands of UK graduates as an instructor, mentor, colleague, leader and engineer of the highest character.” Born and educated in Georgetown, Kentucky, Dean Blythe received his Bachelor of Science in civil engineering at the University of Kentucky in 1940. He worked for the U.S. Forest Service, the U.S. Corps of Engineers and served in the Air Force as an engineering officer advancing from 2nd Lieutenant to Major during his four and a half years of service. He returned to UK in 1947 as a faculty member in civil engineering. Dean Blythe became a professor and was department chair for 12 years. He received his Civil Engineer degree from UK in 1948, based upon research in concrete materials at the U.S. Corps of Engineers laboratory in Cincinnati, and his MCE degree from Cornell University in 1950. Dean Blythe became Associate Dean for Continuing Education and Extension at the College of Engineering in 1968, served as associate director of the University of Kentucky Institute for Mining and Minerals Research from 1978 to 1983 and in 1986-87, was chair of the Mining Engineering Department and executive director of the Mining Engineering Foundation. He is a licensed professional engineer and land surveyor, and has been president of the American Society of Civil Engineers, Kentucky Section. Dean Blythe served as a civil engineering professor in Liberia, at the University of Durham in England, and in Ecuador as a Fulbright Scholar. His wife, Jeanie, and their three daughters accompanied him on most of his assignments. After his retirement, he continued to participate in the Engineering Alumni Association and enjoyed keeping in touch with other alumni and friends in the National Alumni Association. He was active in community activities, serving six years as a member of the Lexington-Fayette County Planning Commission and two years as president of the Citizen’s Association for Planning in Fayette County. He was active in his church and functioned as an officer and chair of several committees. 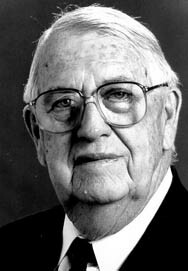 Dean Blythe was inducted into the College of Engineering Hall of Distinction in 1993. He died January 21, 2005.